NJOY has earned 4 STARS and is RECOMMENDED WITH CERTAIN RESERVATIONS due to the high cost of the refill cartridges. If you have a limited budget for your e-cigarettes, NJOY may not be the ideal option for you. Additional concerns include the continued availability of NJOY rechargeables. The Deluxe Kit reviewed is no longer available — see gray notice box below. It would appear from the current NJOY website that the company has phased out 2-piece rechargeables in favor of the new NJOY King disposables. The Deluxe Starter Kit is no longer available, but their site continues to sell cartridge refills. 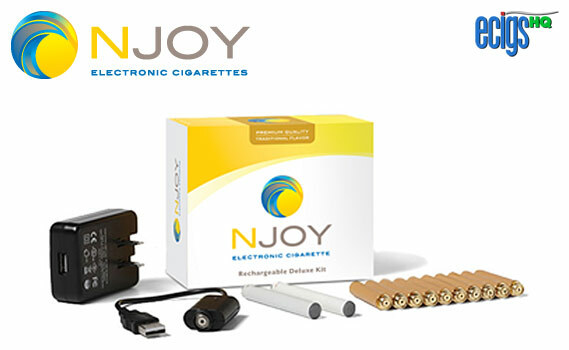 One of the oldest brands on the market, NJOY has evolved from a three-piece design (NCIG) to its current, two-piece unit. Best known for their convenience store displays, NJOY produces quality rechargeable e-cigarettes for a large group of dedicated customers. The NJOY Rechargeable Traditional Deluxe Kit includes six regular strength flavor cartridges (1.8 percent Nicotine by volume), and four light flavor cartridges containing 1.2 percent Nicotine by volume. The kit also includes a User’s Guide for the NJOY e-cigarette as well as a 3.6V USB battery (Lithium) charger, 1 AC adapter used for USB connection, . Upon opening our kit, we discovered that each cartridge is wrapped individually. This helps prevent the nicotine from drying out as well as preserve the flavor of the tobacco. The cellophane wrapper bears the expiration date, name of the flavor, and strength of Nicotine, of each cartridge. NJOY is has put significant effort into keeping the flavor of the cartridge pure and fresh. Furthermore, NJOY has a simple design. Users simply need to take out one of the two enclosed batteries in the kit and attach it to a tobacco flavored cartridge, then inhale and enjoy the smoking experience. Like the better electronic cigarettes we have tested, NJOY draws and tastes like a real tobacco cigarette. The NJOY weighs and is about the same size as the Green Smoke e-cigarette short battery, but its cartomizers are somewhat larger. However, the cartridge size and the above-average vapor volume of these units are not what makes NJOY e-cigarettes enjoyable to smoke. The feature that makes NJOY standout from lower-ranked e-cigarette brands is the flavor of the cartridges. According to our estimates, the cost of maintaining a single pack-a-day habit by using NJOY electronic cigarettes is approximately $4.54 per day, $31.83 per week, $137.94 per month and $1,655.22 per year. Our calculations estimated each NJOY cartridge as equal to 1 pack of traditional cigarettes and included the cost of 1 NJOY Rechargeable Traditional Deluxe Kit ($49.95) per year. While NJOY Starter Kits are reasonably priced, owing to the high cost of the refill cartridges, it is more expensive to smoke than our highest-ranked brands, but remains less expensive than traditional tobacco cigarettes. Additional concerns include the continued availability of NJOY rechargeables. The Deluxe Kit reviewed is no longer available — see gray notice box above. NJOY does not presently provide coupon codes. Want a great chance to win a FREE Green Smoke Pro Kit? Click here to enter the March Mania Green Smoke Giveaway. Odds of winning are 1 in 33.3(!) but the giveaway closes on April 8th — so get there now!